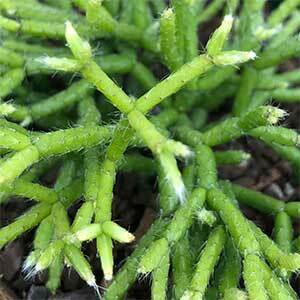 The Mistletoe Cactus are a varied group of plants and are all Rhipsalis species. With over 30 species, that all differ in growth habit, it is not much help when choosing what to buy to simply describe them as Rhipslais. 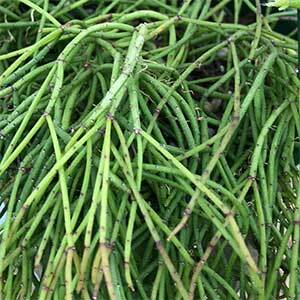 The long trailing one is usually Rhipsalis baccifera / Rhipsalis cassutha and this makes a great plant for a hanging basket and it will trail to nearly 50 cms. From South America and Central America, mainly Uruguay and Brazil, these are a shade loving plant, or more correctly it like indirect sunlight. In direct sun the foliage tends to yellow rather than keep the attractive green colour. They naturally an epiphytic plant, and are succulent, and a cactus, as such they do require watering, however never soggy wet soil. At first the growth habit is bushy, with the trailling varieties as it matures the stems get longer and begins to trail down like a green waterfall. Rhipsalis baccifera / Rhipsalis cassutha is grown widely in vertical gardens, as an indoor plant, in hanging baskets in shaded positions and even as a feature plant in wall mounted planters. Other species have different growth habits, stem shapes and flower colours, some having spines or thorns as well. You could also grow it as an epiphytic plant on a tree or tree fern slab. 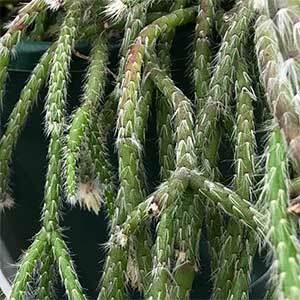 As long as you protect your Mistletoe Cactus from direct sun, and provide a well drained soil, and water as the soil dries, you should have few problems growing this easy care plant. Although they are a succulent, they are not drought tolerant, so some watering will be required. Good filtered or indirect sunlight. Do not over water, wait until the soil dries on the top layer at least. Provide a little extra humidity in summer months. Fertilise with a liquid seaweed fertiliser in spring and summer.